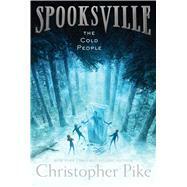 Frozen enemies make for a chilling challenge in this fifth book in New York Times bestselling author Christopher Pike’s Spooksville series—now on TV! Adam and his friend are exploring the forest near Spooksville when they come across huge blocks of ice, hidden among the trees. They decide to melt one of the blocks, but when they do, a strange man comes out of the ice and tries to grab them! The man has very cold hands—and his eyes aren’t too warm either. Soon there are dozens of Cold People running around Spooksville, freezing the residents. Adam and his friends have an idea that just might save the day. Or will it get them turned into human popsicles?